Jo Walton's generic RPG has left me drifting, wide-eyed, naked and alone between conflicted worlds. Shave away the flowery language and you have a generic lite system with an interesting mechanic twist portrayed with humour and a gentle read. Players pluck up to 10 skills from the ether of their imaginations. For my players, that's a dark purgatory filled with the shrieking souls of the damned. 100 points are assigned across them. One skill acts as a primary, which is the thing your character is best at. You get 20HP too. XP is used to improve your skills. All actions (including combat) succeed by rolling under your skill on a D10 (normal tasks), D20 (hard). Any dice combination will work, the more you roll, the harder it is. Every skill begins with a number of points equal to the skill's level. For example, you have "Punching" at 20 then you start with 20 points. If you succeed in an action (roll under), then the total you roll is subtracted from your skill points. Or you choose to fail and keep those points. You don't get those points back until you rest (or the GM says so). There is an intriguing situation this causes that I'm going to call skill burning. Byrn has a Hacking skill of 30. He's really good at it. He wants to Hollywood-Hack to save the whole team. It's hard difficulty. He's asked to roll 1d10 + 1d20 and rolls 10 and 19. A pass. The table erupts, players are jumping up and down. He doesn't want to burn 29 of his 30 points but he has no choice and is left with 1. In our example, Byrn can't use Hacking again because his skill is burned. He has to rest, have a bard play a song or get a Swedish massage. Hacking is no longer open to the group, they have to find another way. I like this mechanic very much but it does mean that, as a GM, you have to be very very careful with how you set up your scenes. A boss fight, for example, must offer the players multiple ways of defeating it beyond wearing down hit points to zero. It is one thing to force players to think of new solutions but you need to ensure that other options are open; and that is difficult. The advice is that the players can do imaginative and inspirational things to entertain the GM enough to regain points during the game. The GM then has to be careful to balance rewarding players who work around their burned skills, patiently waiting for a natural regain and those trying to force new points mid session. A mechanic of story points and skill burning can be retrofitted into just about any system. Most systems I read have a roll against target number and a concept of skills or attributes; most will delight the players when they narrowly succeed. Many fit the idea of giving the player the choice to fail for some benefit. The lighter a system, the more focus it needs. The roleplaying hobby could boil down to 6 friends seated comfortably and just plucking everything from their imaginations. A game book that persistently reminds the reader that they can just ignore the rules and make it up smells like one that lacks focus. Instead of "You may sometimes", I would rather read "In situation X, do Y". 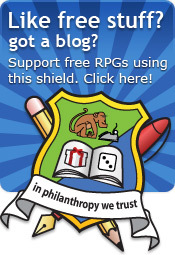 Only add optional rules or attributes if there is mechanic or narrative benefit. This tightens the game and gives it focus. Drama and Dice has a focal point: the skill points, which should be bold, front and centre. Another sign of a lack of focus is when the introduction does not match the game as a whole. I was expecting Drama and Dice to give players more narrative control for drama. Instead, the players are forced to work around their character design. That is an interesting twist but I wouldn't say it drives the story any more than a normal skill check failure does. I think that most player groups would play the mechanic, not the narrative. I can imagine discussions "should I burn all 29 points on hacking or should I fail now so I can hack later? Will we get a regain?". That is not a decision based on the narrative being played out but on the mechanic; the narrative being a bi-product. I think that would suit my group of frenzied Berserkers; the risk, reward and choice is clear. 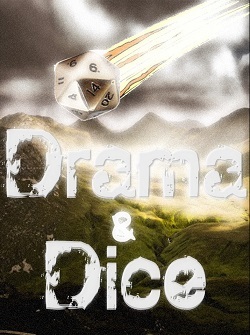 Drama and Dice isn't a storygame as the name and introduct suggests. It is a roll-against-target-number system with the fascinating addition of burning up skill points and forcing players to find another way - to lose the very ability that defines them. Skill points is a resource control mechanic that can brutalise a player team's best laid plans and I'm all for that! mmm, that's a simple idea that creates interesting decision making. Is this the same Jo Walton of science-fiction fame? @Aldo - As I come back to this review, I realise that the twist mechanic is so wonderful because it can be transplanted into other systems. I wonder if there are more mechanics like that? @TQuid - You're not the first to be confused. As Jo points out on his website, he is another Jo entirely. :) How blessed we are to have two very creative Jo Waltons in the world.